Since 2011, the “Agricultural Water” working group (AVSF, Gret, Agter) of the Agriculture and Food Commission (C2A, Commission Agriculture et Alimentation) of Coordination SUD has been working to develop and disseminate advocacy in support of water access for family farming in the South. Water is a common good that must first and foremost serve the general interest, and which cannot be shared solely on the basis of the laws of the market. 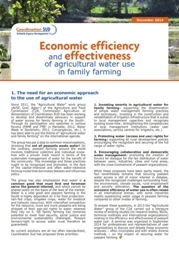 After recalling the need for an economic approach to agricultural water and using different examples, the authors examine how the economic efficiency of the use of agricultural water can be addressed : What is the net wealth created ? How is it distributed ? What indirect effects may be generated by the various forms of water use. While the economic efficiency of agricultural water use is an important criterion to steer investment policies and programmes, or to prioritize certain types of use and users, the analysis and measurements carried out by both public and private actors until now have only partially taken into account all the above- mentioned elements: the value added created per ha and m³ of water, the modalities of redistribution and jobs created, and the externalities generated, whether positive or negative. To do so, it is important to carry out analyses of agrarian systems taking collateral effects and the benefits and cost induced into account from the outset. Studies should not just consider the catchment area in which water is collected, but also the “extra-catchment” area in which the water is redistributed, as well as the adjacent coastal area. In other words, it is necessary to resituate the reality observed in the cycles of the water used. We will have also to make use of prices that correct most of the artificial effects produced by subsidies or by the existence of uncompetitive markets. Finally, taking into account future generations and the long term will require analyses that cannot be based solely on quantitative evaluations. In these conditions, the assumption that water can become a commodity like any other makes no sense. Nor is it a public good which everyone could access free of charge. It is at once a public good, a common good –sometimes common to several distinct communities–, and a private good. But it is thus not the same water at stake in each case, even though all these waters are essentially comprised of H2O molecules. These are the differences that need to be highlighted in order to pursue and deepen the reflection surrounding the social justice in water issues and to understand when and how, economically speaking, access to agricultural water for small farmers is in the interests of humanity as a whole. The full version of this paper can be downloaded on this page.